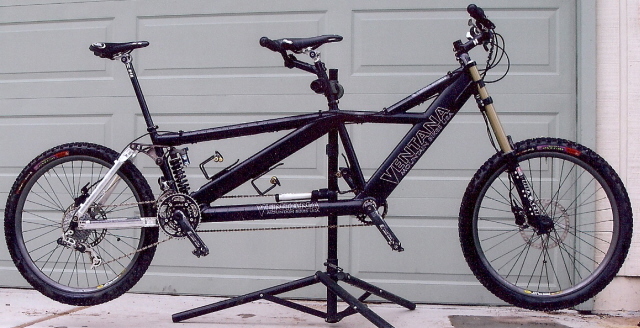 Any Ventana mountain tandem owners here? This photo on Sherwood's website sent me into full-on fantasy mode. that is fantastic. where is it ? Don't know where the previous photo was taken, this one below is somewhere in the Four Corners region...overlooking Valley of the Gods from atop the Mokee Dugway perhaps? Simply breathtaking! V brakes do look a little bit small don't they? Trust obviously plays a BIG role in this! I like how each of these tandems is spec'ed a little bit differently...sorry to pike your pictures Mr. G! Sherwood, tell us more about these when you've got some time. I think that pic is from the Flume TRail in Tahoe. Maybe, looks about right. 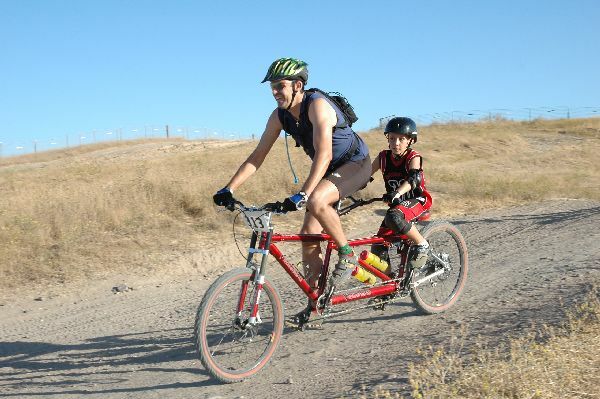 Here are some pictures of my stepson and I racing the local PC race series on my brother-in-law's tandem. 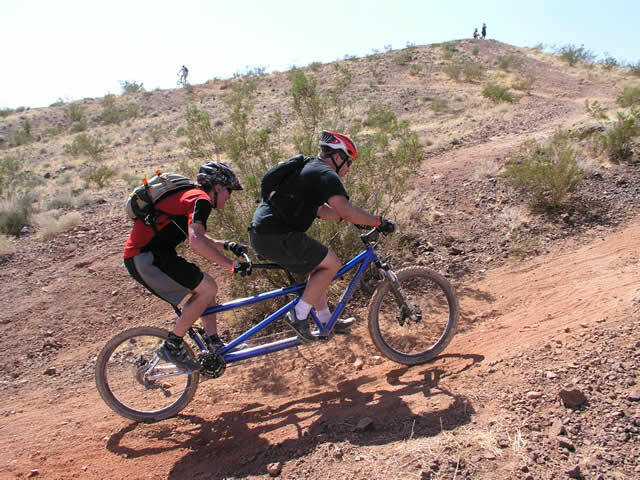 I can honestly say riding/racing a tandem is a lot of fun. Let's see some tandem cliff drops or double jumps! 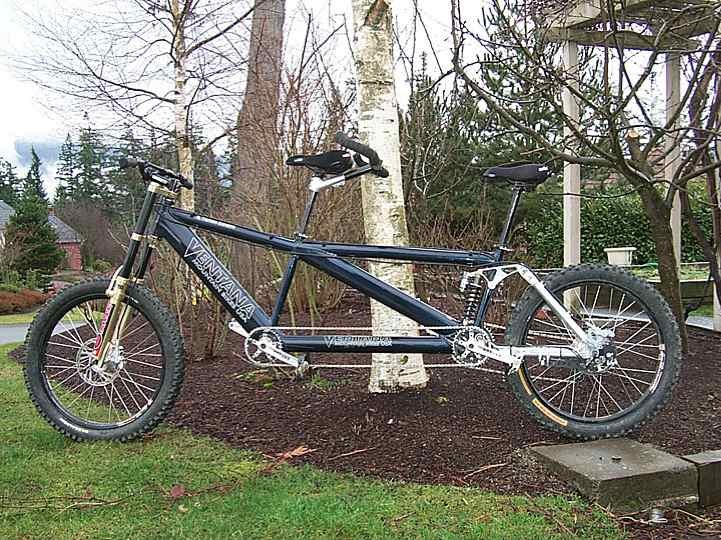 How do you like the Maverick Duc on the Tandem? I was thinkingt about trying mine on my El Conquestador. I asked Maverick about it & they said they couldn't recommend it, but knew of several people who are riding them on tandems. Is it set up for 6" or is the travel reduced? Any noticeable issues? Hey! I know those dudes. Old age and treachery will always win over youth and exuberance. If you call tell him Greg sent ya! Lowrider green with 29er wheels! Sherwood hopes the fork makers will step up to the plate and make something for that kinda application! 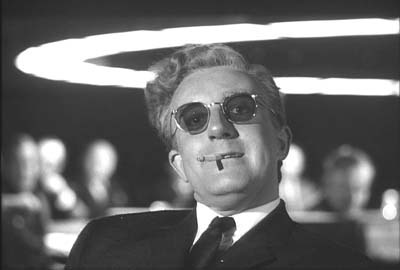 Zee whole idea of ze Doomsday device is lost, if you keep it a zecret! Last edited by Ricky J; 02-08-2006 at 05:39 PM. Last edited by Ricky J; 02-08-2006 at 05:41 PM. .... we have our set up 5" in the rear, and have tried various forks up front (Marz DJ forks, White, a Manitou Sherman Slider double clamp, etc). I'm going to try out a Marz 66SL set at either 130 or 150mm travel. 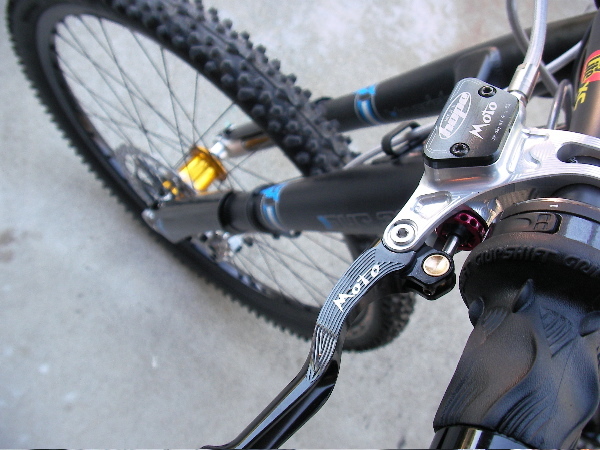 And a Hopey Steering Damper plus a Gravity Dropper for the stoker's seat. Oughta be dreamy. 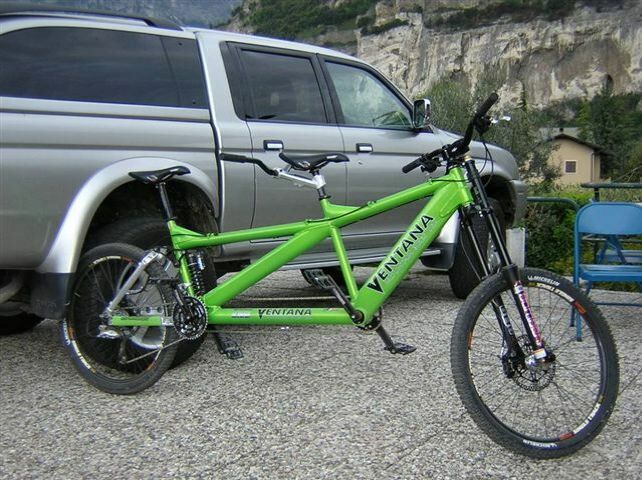 But the Ventana Tandem is the standard for off road tandems! 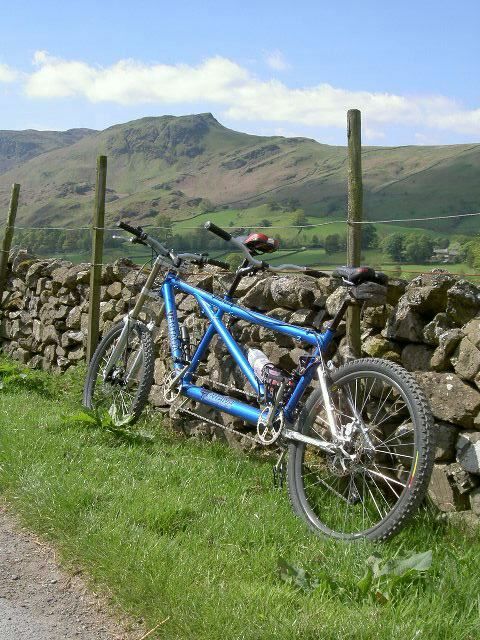 Grrr, can't load any of my tandem photos. Further, I just can't fathom subjecting someone to staring at my big caboose all day long. That would be simply cruel. 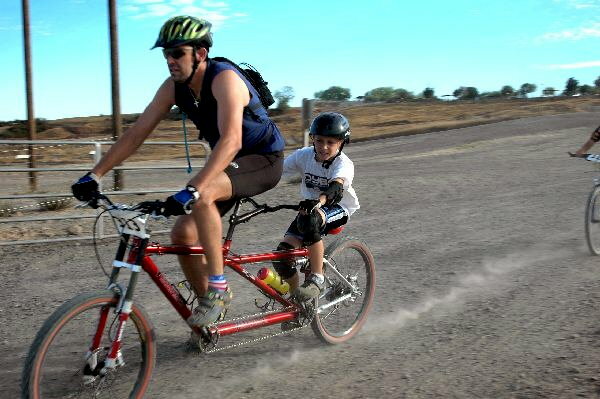 "Kids like tandems.....and I don't even have any kids! I gain favorite uncle status hauling these little urchins around." Pretty dang cool, Sparrow! Which gets me to thinking about a couple troubled nephews of mine...hmmm. 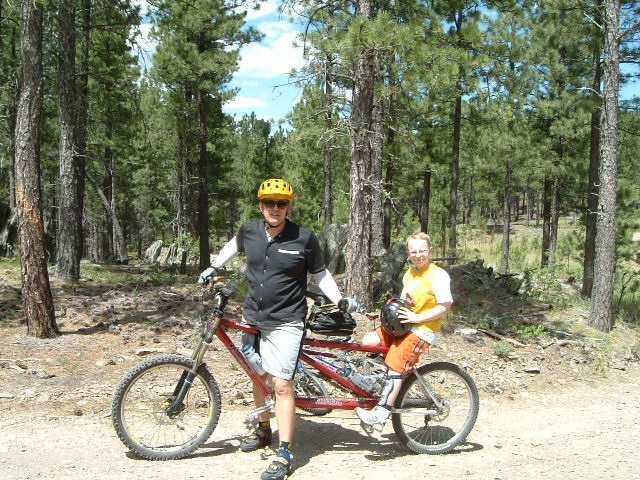 From the Laramie Enduro, 8000' of climbing in 65 miles! 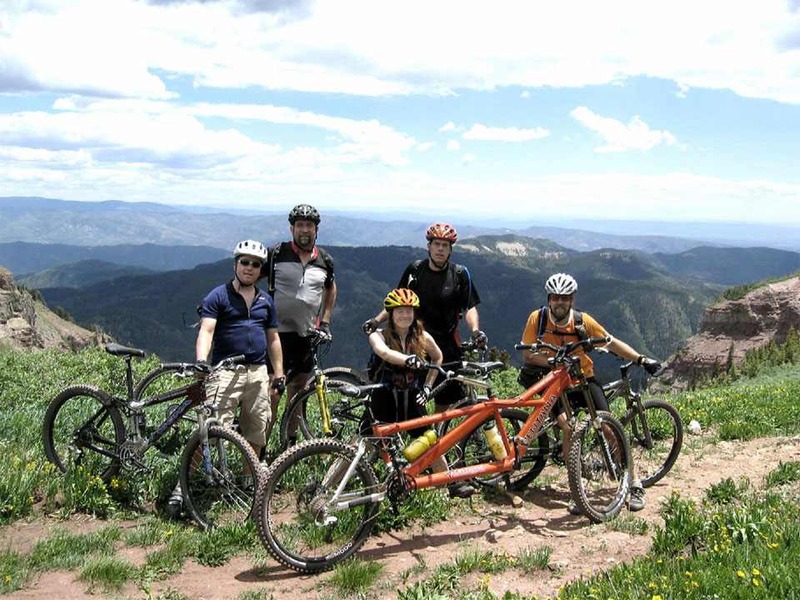 ...will travel: "We've ridden our tandem in Sedona, Moab, Fruita/GJ, Sun Valley, Maah Dah Hey, Black Hills, Phoenix area, Brian Head, etc. 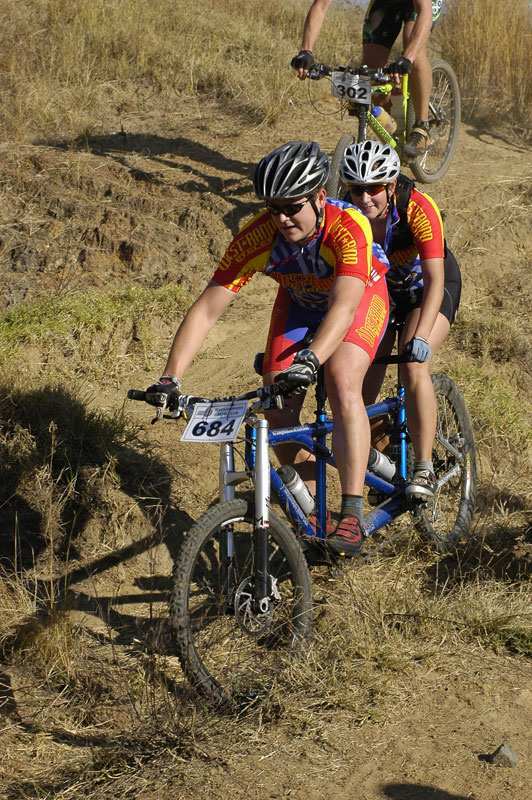 We've done numerous off road races up to 100km and plenty of burly singletrack. 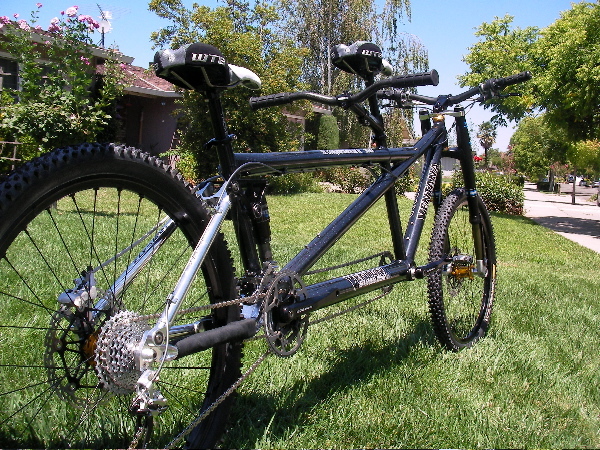 As most any tandem owner knows, you can do more on these than people think. Just about anywhere that is enjoyable for a half bike is fun for tandems!" Thanks for sticking the photos on there, I gotta join the 90s and learn how to operate one of these shiny Computer things. 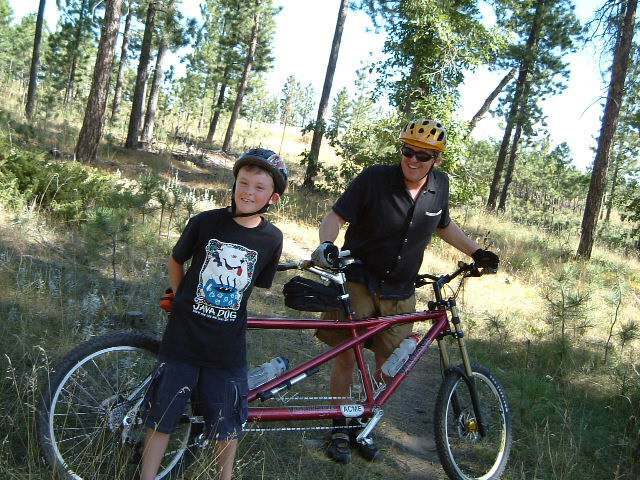 Yeah, the nephews love the tandem. 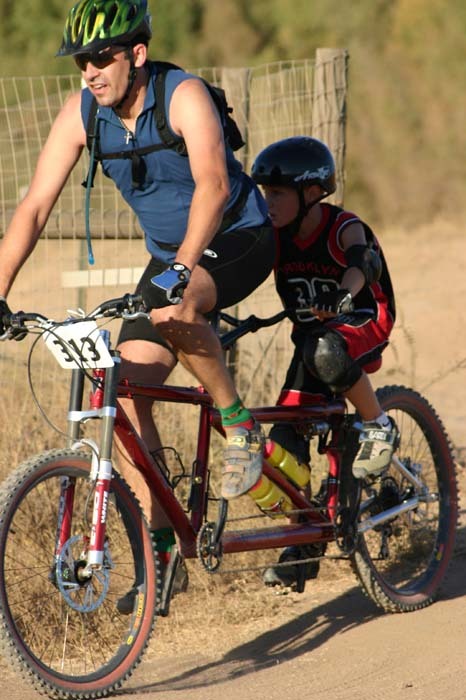 My youngest nephew loves to ride stoker as then his big brother is on his own. That means the little brother can finally woop up on big brother! He loves that. A great equalizer. My Stoker does too, of course. She calls "Clifford, the Big Red Bike", she's a recovering grade school teacher, so she knows all the kid's books. We've had some good fun on our Ventana El Conquistador de Montanas! Looks like Lake Tahoe down below. Tim, I'm perusing Rivendell Reader #37 and just recognized your name as authoring one of its articles! Small world, ain't it? Yeah, looks like from the Flume trail. 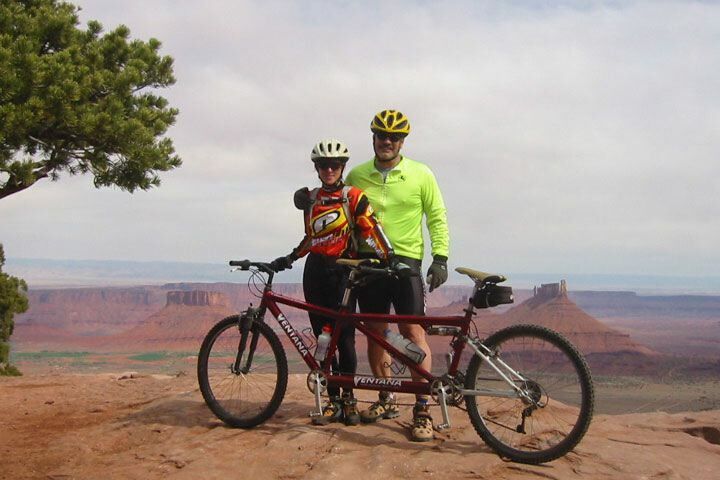 Second pic is top of Porc Rim, Moab. Whatcha doin lurking over here anyway, Hmmmm? Put 5 of those young UK guys on there and I'll bet they could jump the moon with that. 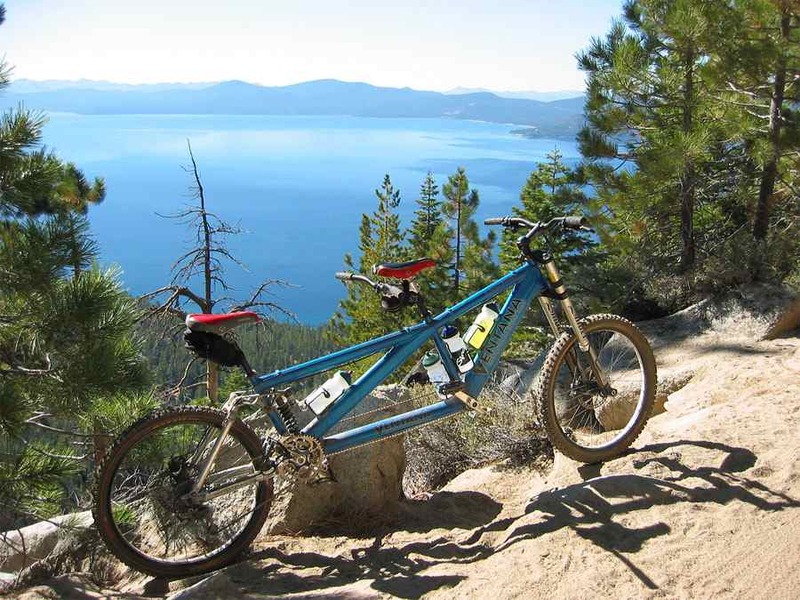 Thats funny, thats my old tandem (the first one on the Flume trail in Lake Tahoe), I built it up in 2001, and sold it in 2003. 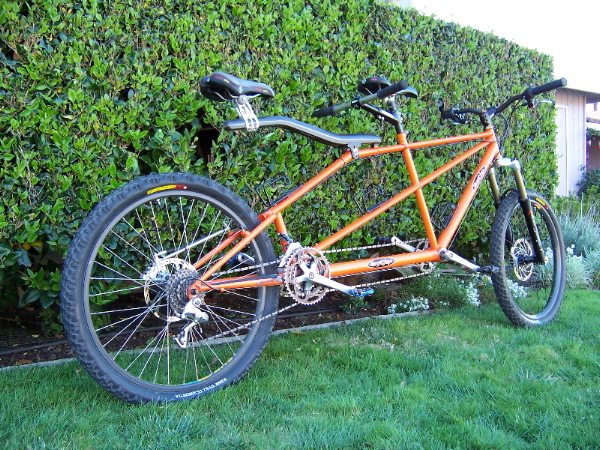 That tandem was awesome, but the new one is better. 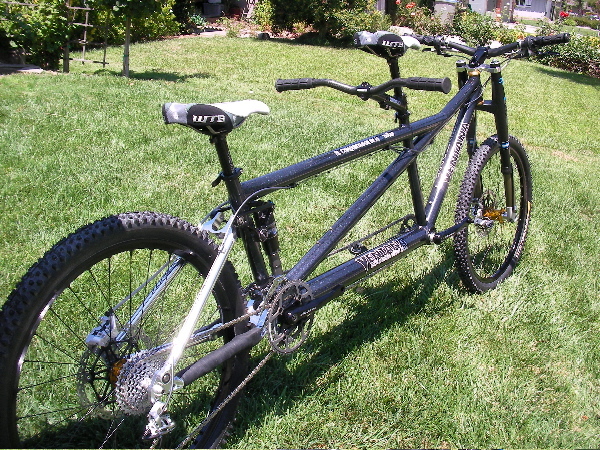 I just finished building this yesterday...I've been riding tandems for some time with my wife/kids as stokers. the kids are really getting into it, and my older tandem (custom '96 Sycip_ was just too big. the workmanship on the el conq is outstanding, as was Sherwood's support as I worked out how to build the right tandem for me. It's about 39.5 lbs without pedals...quick rundown of major build items, then pics (one of the sycip too for good measure. here are a few more pics of the build...some of the components are highlighted. Yep, looks like the Flume to me! 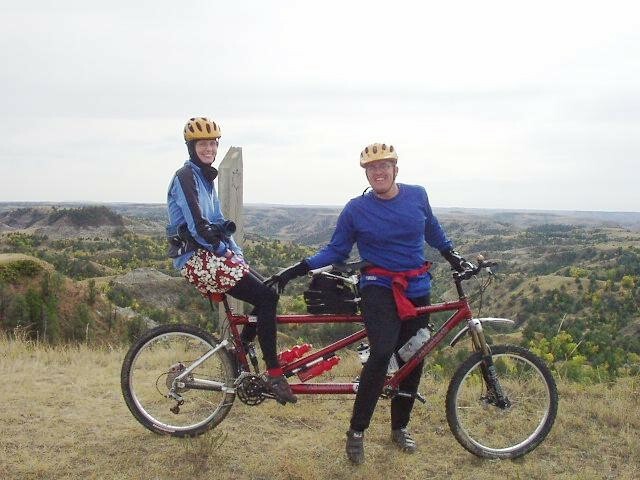 I'd like to ride a Tandem sometime... I've thought about getting one for my wife and I to tool around on. So how well does a tandem clear a large log... can you even get the front end off the ground to set up for clearing a log? What is the breaking like? Do they stop well enough with a larger rotor? Or do you have to allow for more stopping distance? 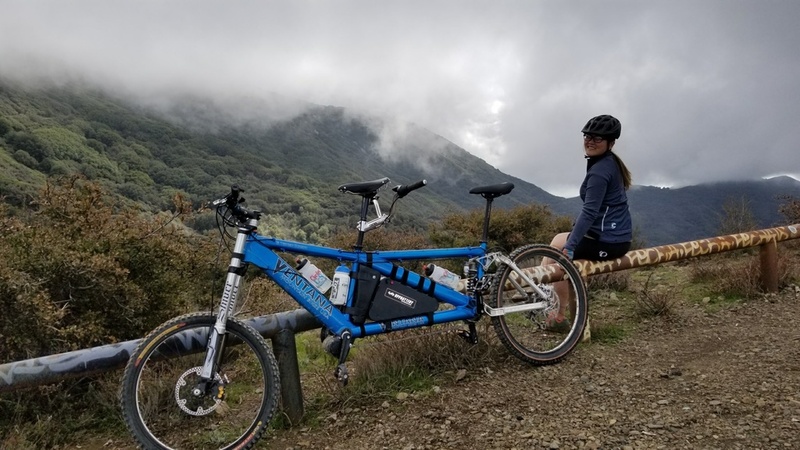 I suspect that the more you ride with your tandem partner the more in sync with them you get and the better you both ride as a team. 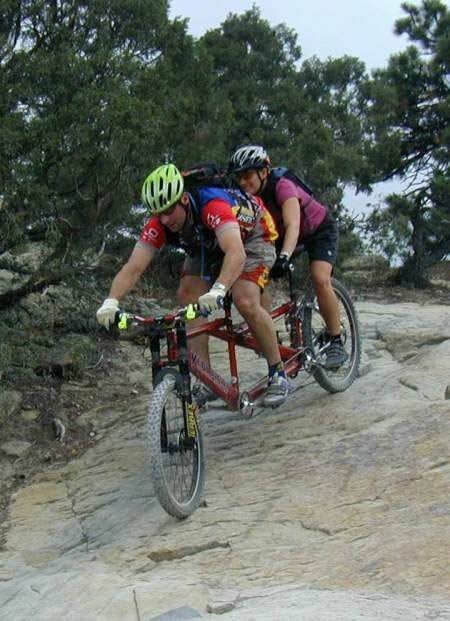 So with that being said... can you do most of the same things you can do on a bike by yourself or are there limitations on a tandem that can not be overcome? Really looks like a lot of fun! 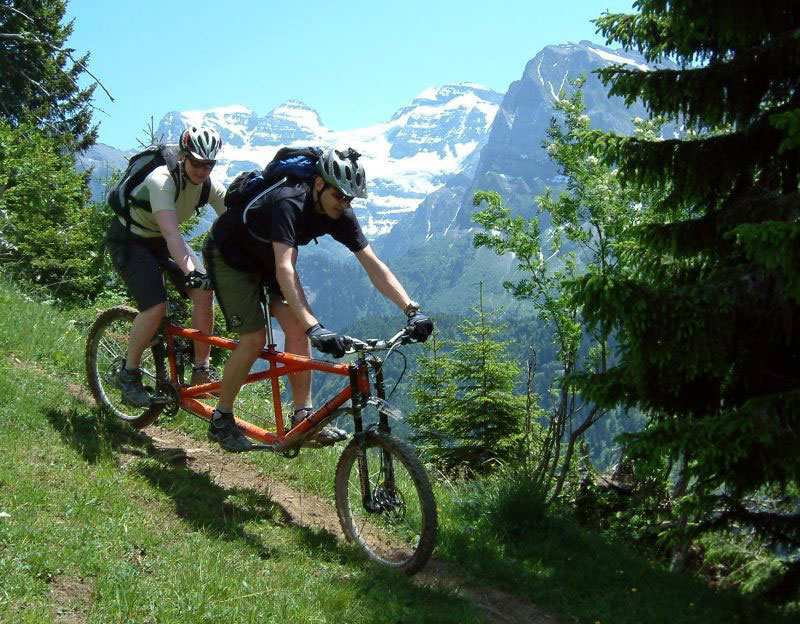 Obvisiously, tandems can't do exaxtly what a single bike can do, such as lifting the front wheel off the ground to clear a log. 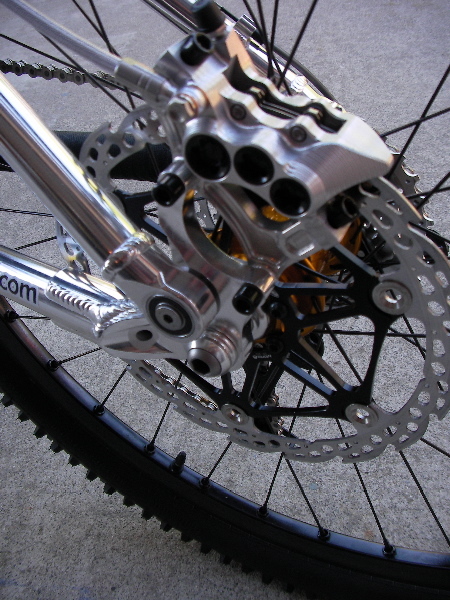 It is possible to clear obstucticles by unweighting the front end and using momentum, which tandems have alot of. I have ridden up a 10 step flight of stairs on ours, by using the mentioned method. As far as braking is concerned, we use 8" rotors front and back and braking distance is not really a concern, since you have so much traction on the tires. Here is a pic of our latest Ventana. 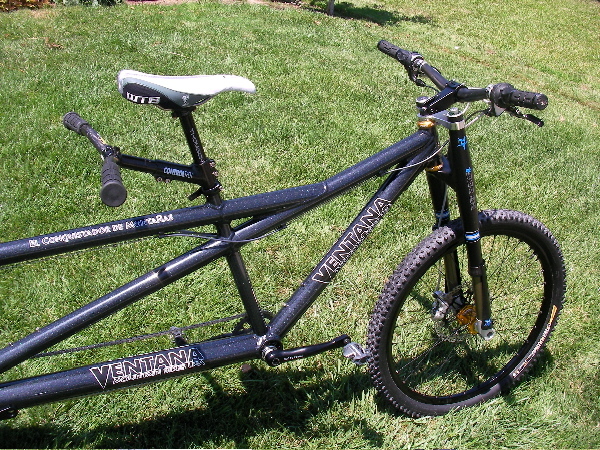 The picture of the blue tandem on the first post was our second Ventana, which we sold in 2003. We love this one and hope to never sell it. Oh, man, I'd really like to see how the turn at the bottom of that turned out! Thats a nice ride! I like your build kit. 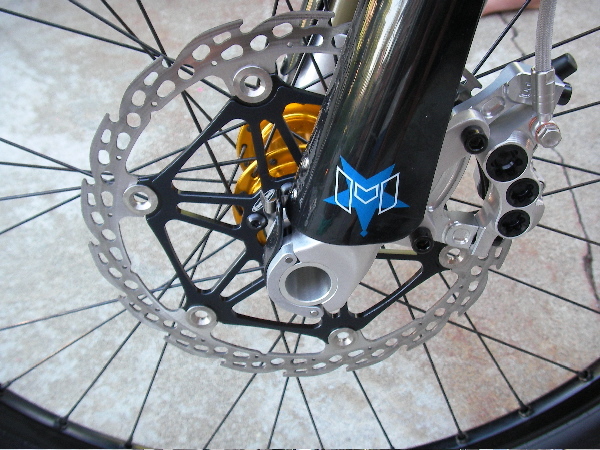 The big question I have though, is the Maverick fork, I know you don't have time on it, since you just built it up, but I'm suspect of anything from Maverick. 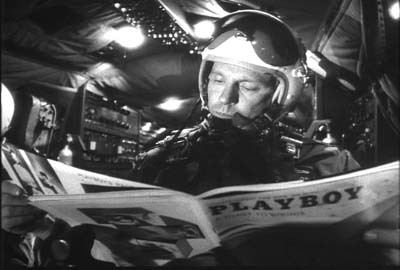 I was curious about the Maverick also. I had asked them about installing one on my El Conquistador & they didn't recommend it. 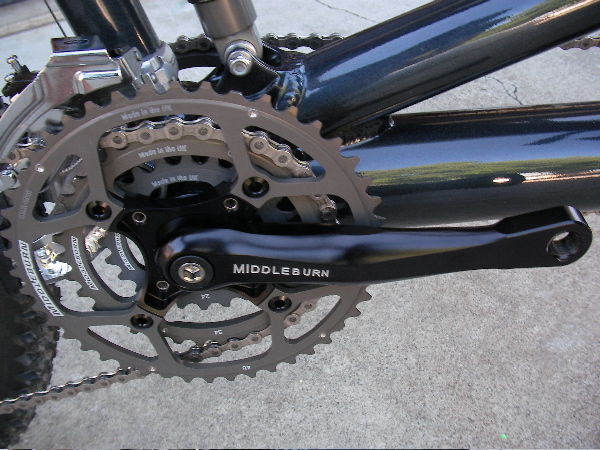 Do you know what makes that fork "Tandem Specific"? Stumbled across this thread today and the first pic I see is my bike! Yes I'm the latest owner of Hurricane Jeff's blue El Testigo. I've made one key modification to it and thats the TSDZ2 torque sensing motor and battery. Now we're a shade faster up the climbs than your average mountain biker instead of being far far slower. This pic was taken a few weeks ago when we climbed up Maple Springs to Four Corners. Santiago Peak is on the left, hidden in cloud. 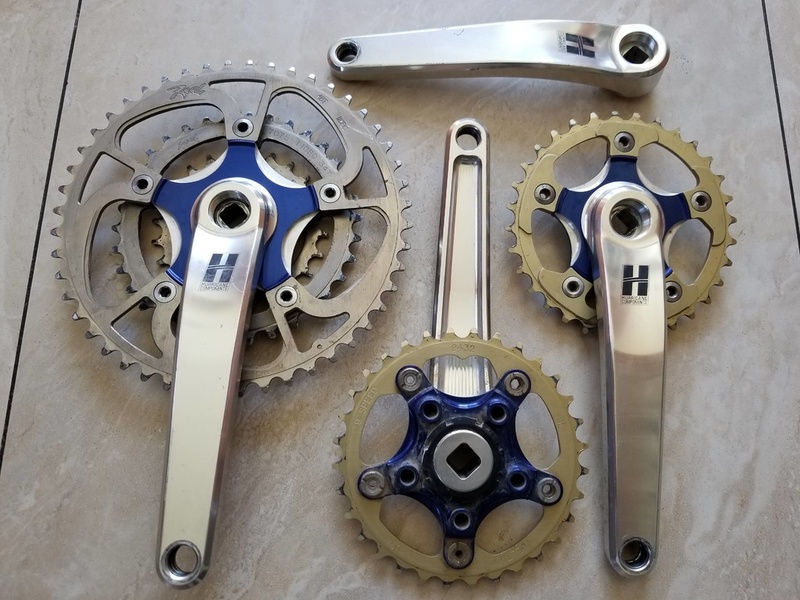 The e-tandem conversion of course means I am no longer in need of the beautiful Hurricane cranks, which are for sale if anyone's interested. (All 175mm).